Are you looking for a stylish bike that can give you comfort during your casual rides? A beach cruiser bike is here for you! Cruiser bikes are designed to provide all the comfort you need during your summer. Some of them have one gear which is perfect for cycling around the town whereas others contain two or more gears to allow you to shift on the inclines easily and support long distance rides. Although simple in design, deciding which cruiser bike to buy can be a tricky question as all the manufacturers include a slight difference than the other. If you are in a bit of confusion on which bike to buy, then here are the bikes are available in different models, sizes, and colors, as well as they, are specifically designed for men and women. The reviews here will help you select one of the suitable bikes from best beach cruiser bikes described. Hopefully, you won’t have to look elsewhere are seeing these cruiser bikes. The hybrid cruiser bike by sixthreezero is an innovation in modern bicycles. The design is so stylish and comforting that it catches everyone’s eye. It provides a great ease while riding and is strongly made with its 17.5-inch aluminum frame. This step-through bike has been designed by keeping the comfort of the rider in mind. For maintaining a proper leg extension; foot-forward design has been incorporated. The shoulders and back are always at ease and comfort because of its upright riding style. The design of the saddle to has been kept in mind. It has been incorporated with dual spring, which is very comfy, curvy and stylish in nature. The detailed explanation of each and every part of the bike has been explained below. The EVRYjourney classic hybrid cruiser is a modern showpiece with its highly glossy components made of chrome. The handlebars are not like the old model type, it has been designed with all new technology. The handlebars id of sweeping type, which is a combination of the ideal curves of hybrid and cruiser handlebars. Because of this design, the shoulders are always kept in a relaxed position during rides along with upright back. The tires are very important and integral parts of the bike. Its design is of utmost importance and hence sixthreezero incorporated stylish looks and features to its tires. The tires are soft and wide in design that allows the bike to roll softly and smoothly on the road. The semi-slick tires are 1.95-inch wide that gives the benefit of rolling on a wide range of terrains like hard packed trails and paved surfaces. One cannot simply enjoy the ride without a proper seat. EVRYjourney’s seat is engineered in such a way that they are able to absorb most of the shocks caused due to bumps. The dual spring feature plays an important role in achieving such comfort. With its extra wide saddle, the rider can easily sit for miles without any complaints. The feature of Smooth Cruise Configuration has been installed by sixthreezero in this EVRYjourney bike. This feature allows a smooth pedaling and at the same time provide enough torque for fast rides. The EVRYjourney bike for women has been manufactured with four gearing options. The first one is a simple single-speed model that is ideal for flat terrain and also comes with coaster brakes. The second one is a 3-speed bike that has Nexus shifter, which allows the rider to handle moderate hills and longer distance. Front and rear hand brakes are provided in this system. The third one is the 7-speed bike that allows the rider with a wider range of riding. It also has front and rear hand brakes. The fourth one is the 21-speed bike that has EZ Fire Plus Shifter, which allows demanding streets to be tackled easily. This one also comes with hand brakes in the front and back. The bike is 26-inch in length with 1.95-inch wide tires. The frame is made up of aluminum and is 17.5-inch in length. Chrome parts have been incorporated for providing an extra strength to the frame. This bike is ideal for women of the size between 5 feet to 6 feet. The bike comes in Cream, Navy and Teal colors. The rider can choose any one of these colors and start riding anytime. The classic urban beach cruiser is designed specifically for men. It has curvy looks along with stylish design. It has a durable steel frame which is 17-inch in length and is 26-inch in length when calculated along with the aluminum wheels. 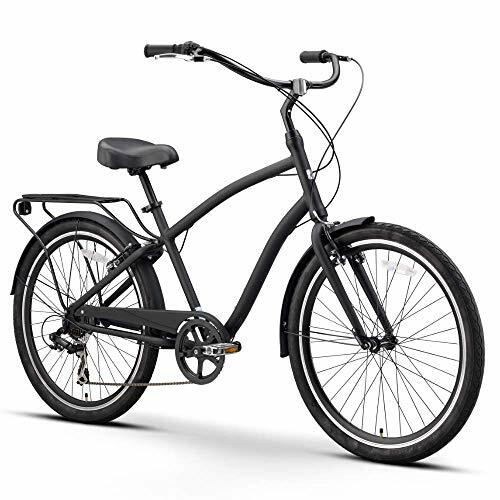 Not only on the beaches, but this Urban Man Cruiser can also be used in many places and environments like on a paved path or around the town. The gearing system is not complicated in design and the bikes very easy to ride with minimal work. Below you can find all the features and specification of this Cruiser bike. The Urban Man bike by Firmstrong is an innovation in the modern world. The design of the pedals, the gearing options, the framework is a class apart. Handlebars are designed in such a way that it gives it a sleek look. Foam grips are incorporated on the handlebars for proper grips and handling. The seats are provided with double coil springs that absorb the bumps experienced on a rough terrain. The seat is also oversized that makes the ride soft and smooth. A long and jerk-less ride is promised with the seat provided in this Urban Man cruiser bike by Firmstrong. As we already know that the tires are one of the most important parts of the cruiser bike. It has to be designed with a great care. The grippy whitewall tires are 2.125-inch wide that absorbs most of the bumps experienced on the road. The Urban Man bike by Firmstrong is available in three different speed types. The first one is the single-speed type, which is ideal for flatter terrain. It has a riding distance of 20 miles and has knobby cruiser white wall tires. The frame size of the single-speed bike is 24-inch. The second one is the three-speed cruiser bike that is used for longer rides and climbing hills. 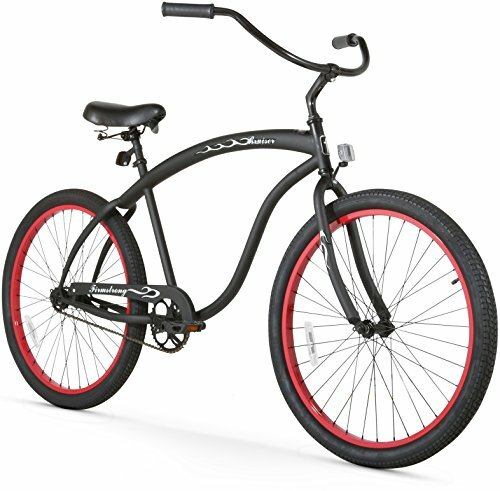 It can be used for a riding distance up to 30 miles and has slick tread cruiser white wall tires. The size of this bike is 26-inch. The third one is the seven-speed cruiser bike that is very much useful for high-intensity riding and is reliable for up to 40 miles distance. 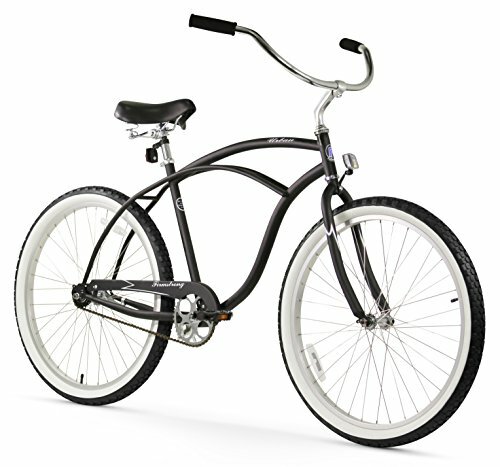 Top-of-the-line gear shifting system is provided with this bike and has slick tread cruiser white wall tires. The single-speed cruiser bike is 24-inch in length and the remaining 3-speed and 7-speed bikes are 26-inch in length. The frame is made up of durable steel and is 17-inch in length. The wheels are made up of aluminum and the handlebars have foam grips on it. The single-speed Urban Man cruiser bike comes in Shiny Brown, Royal Blue, Red, Orange, Matte Red, Matte Grey, Matte Brown, Matte Blue, Matte Black, Emerald Green, Chrome Plate, Black, and Army Green. The 3-speed and 7-speed cruiser bikes come in Red, Orange, Matte Black, Matte Grey, and Black. The Urban Lady cruiser bike by Firmstrong is specifically designed for women. It is manufactured by installing looks and design that suits best for the ladies. It is almost the same as the Urban Man bike except for a few changes. 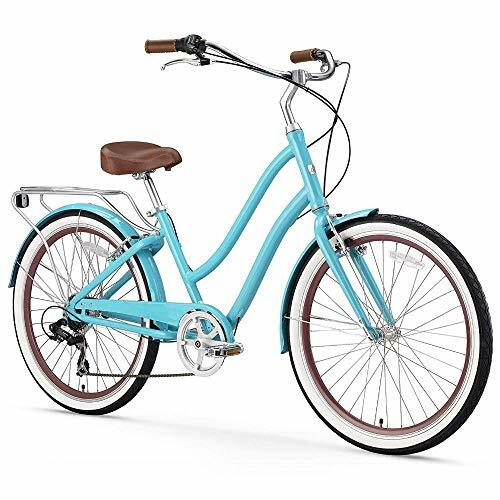 This bike comes in the list of best women’s cruiser bikes and below you can find the detailed description of the cruiser bike. The Urban Lady provides a smooth and comfortable ride for its rider with its sleek design. The pedals are perfect for easy rotation and have three gear options. Rear coaster brakes are provided in the single-speed and 3-speed models, while the front and rear hand brakes are provided in the 7-speed model for added versatility. The seat is oversized in nature and has double springs just like the other. The function of the spring is the same as before, to provide a jerk-free experience while riding. The whitewall tires are 2.125-inch wide and can easily absorb bumps. The bike gearing options are exactly the same as the Urban Man cruiser bike. The Urban Man bike by Firmstrong is available in three different speed types. The first one is the single-speed type, which is ideal for flatter terrain. It has a riding distance of 20 miles and has knobby cruiser white wall tires. The frame size of the single-speed bike is 24-inch. The single-speed and 3-speed cruiser bike are 24-inch in length and the 7-speed bike is 26-inch in length. The frame is made up of durable steel and the wheels are made of aluminum. The single-speed bike model is available in White w/ Pink Rims, Black w/ Pink Rims, Army Green w/ Pink Rims, Yellow, White, Vanilla, Red, Purple, Pink, Orange, Matte Black, Mint Green, Chrome, Black, Blue, and Baby Blue. 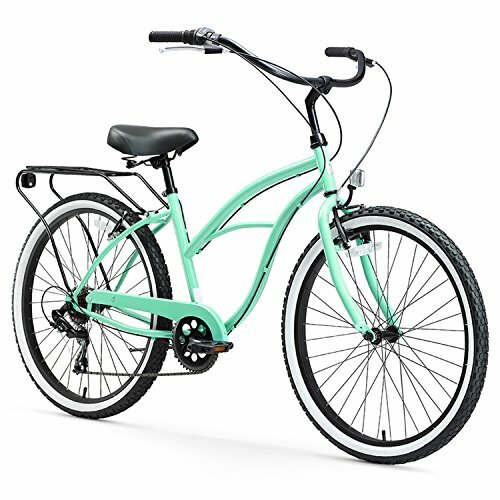 The 3-speed and 7-speed cruiser bike models come in Vanilla, Red, Purple, Pink, Mint Green and Baby Blue. The Around the Block cruiser bike by sixthreezero is 26 inches in length and specifically designed for women. It is curvy in design and has a stylish look that will easily catch the eye. A rack is provided with the bike for optional panniers and baskets. Here are some details about this awesome looking bike that you must know. The bike is classic in design and provides a great comfort while riding around the neighborhood. The durable steel frame provided is 17-inch in length. A great amount of comfort is felt by the shoulders and back due to its upright riding style. The saddle comes with dual spring system and foam grips are provided on the handlebar. There are four gearing options available on this Around the Block cruiser bike. Single-speed for flat terrain, 3-speed for long distance and moderate hills, 7-speed for demanding streets and 21-speed for uphill riding. The bike has a 17-inch frame length and a total of 26-inch including the tires. The wheels are 2.125-inch wide. The cruiser bike is made up of a durable steel frame with aluminum wheels. The Around the Block bike comes in fours colors. Those are Teal Blue, Mint Green, Light Plum, and Coral. The Chatham bike is specifically designed for men for having a good beach ride. It is 26-inch in length with a wide adorned tire. Here are some of the highly likable features of the beach bike that everyone should know. A classic look and vibe are provided in this Chatham men’s beach cruiser bike. The streamlining of the bike is done in such a way that it provides an impressive, straightforward riding with little to no maintenance. The steel frame is hand-built and the high handlebars have cushy grips on them. To avoid any sudden jerks from the road, highly advanced shock-absorbents are provided. 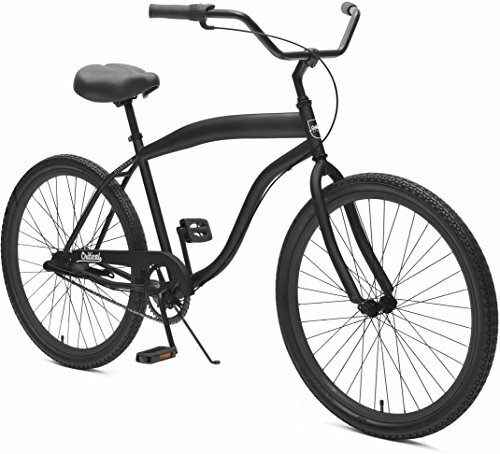 It comes with a coaster brake and provides a great comfort in the upright riding position. The weight of the cruiser bike is 40 pounds. This men’s beach bike by Critical Cycles comes with three gearing options. Those are 1-speed with coaster brakes, 3-speed with coaster brakes and Sturmey Archer GripShifter and 7-speed with RevoShift Grip Shifter. The bike is 26-inch in length and the wheel width is 225-inch. The standover height is 43 centimeters. The frame of the bike is handmade high-tensile strength steel and the wheel has aluminum frame. Chatham by Critical Cycles comes with a wide range of colors. The single-speed cruiser bike comes in White and Black, Matte Black and Deep Blue, Matte Black, Graphite and Orange, Graphite and Green, Blue and Black; and Black and Red. The 3-speed and 7-speed bikes come in just three colors. Those are Matte Black, Graphite and Orange; and Blue and Black. For women, this cruiser bike by Critical Cycles is kind of a revolution. The stylish look and nicely built design give a jaw-dropping experience. Here are the features of this bike that you should definitely know. 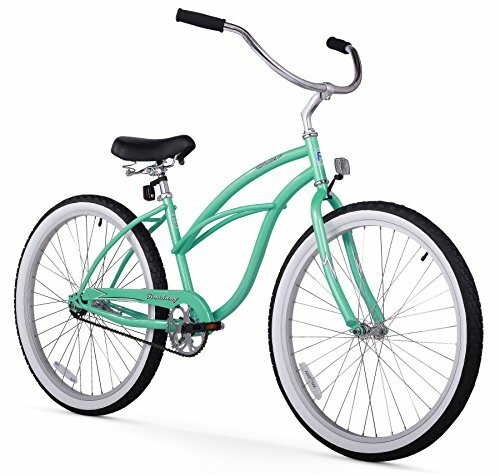 The beach cruiser bike has a step-thru frame that is made out of high-tensile strength steel. The frame is said to be virtually indestructible and has shock-absorbing feature. Getting on and off the bike is very easy due to its low standover height. A great amount of comfort is provided by its higher handlebars. For stability the tire on the Chatham cruiser is extra-wide. This feature also provides better shock absorption and grip. The tires are responsive, resilient and reliable with having a size of 2.25 inches. The double wall rims on the tires provide extra support and extend its life. The pedals are lightweight and durable, the saddle is extra wide and the grips are cushy making this cruiser stand apart from the others. This cruiser bike comes with three gear options. The first one is a single-speed design that comes with coaster brakes. The second one is 3-speed and comes with coaster brakes and Sturney Archer Grip Shifter. The third one comes with the 7-speed option and has dual front and rear caliper with RevoShift Grip shifter. The bike is 26-inch in length and the wheel width is 2.25-inch. It has a standover height of 43 centimeters. The frame of the bike is handmade high-tensile strength steel and the wheel has an aluminum frame. The V-brakes are made of Promax alloy and the pedals are made of hard plastic with Boron steel axle. 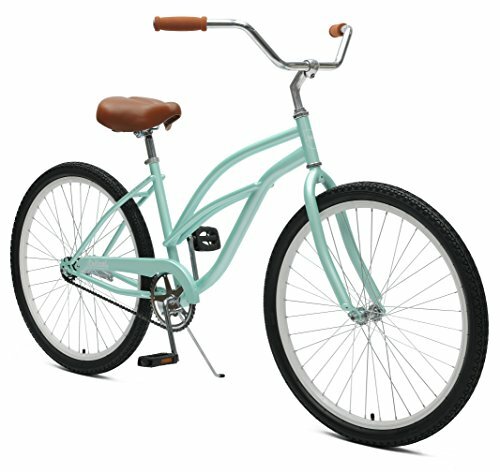 A variety of colors are available for Chatham beach cruiser by Critical Cycles for women. The single-speed gearing bike comes with Turquoise, Sky Blue, Sand, Coral, Seafoam, Blush Pink, Black, and Purple. The 3-speed and 7-speed come with Sky Blue, Sand and Coral colors. This EVRYjourney classic hybrid bicycle has a matching 26-inch full fender wheels to give you ultimate comfort during your commute riding and leisure. With its internal hub of 7 speed from Shimano, it is the ideal cruiser for uphill, street, long distance and trail riding. The center of gravity of its forward pedaling is lower enough to allow for a proper extension of your legs and your back remains upright while riding. You can easily dismount and amount off and on the bike by standing over your bicycle seat when in full stop. The color of its frames blends perfectly with that of the grips and seat giving a classic sleek look of this hybrid cruiser. The rear and front handbrakes ensure precise and easy stopping. The cruiser’s classic frames, mechanical configuration, and the additional unique features make it the beginner bike for riding in every situation be it shiny rainy, cruising or city riding. The dimensions this EVRYjourney 7-speed cruiser are 56x29x8 inches, 39.7 pounds original weight. The chain guards and fenders are awesome particularly for users who have never had them since they were children. The handlebars are wide enough to allow you to rest your hands on them comfortably without pressure. It is even more comfortable when the pedals are as close to the ground as possible and you are sitting upright during your ride. The 7th speed gear is the fastest even on steep hills. It is simple and straightforward to assemble especially for users have a deep knowledge of bikes. The instructions contained in the user manual might be limited to some parts but there is no reason to worry, contacting the manufacturer will help a great deal. Firmstrong bruiser man ensures that you get to enjoy the easy and smooth ride it provides. The cruiser is available 26 inches it’s suitable for riders who are 5 feet and 4 inches tall to 6 feet and 2 inches in height. The single speed in Bruiser Man is ideal when you are going for a casual ride, the three speed allows for hill climbing and long rides, and the seven-speed is designed with a high-quality shifting system, the internal gear from Shimano which enables you to ride for longer distances and enjoy a higher intensity cycling that you have never imagined can be possible with beach cruiser. Coaster brakes are placed on the three speed and the single speed while the 7-speed provides rear and front handbrakes which are operated from the levers that are present on handlebars. The curvy and classic steel frame is enhanced by aluminum wheels which 26-inches are featuring 2.125-inch broad wall tires that are white in color. The tires roll easy and smooth and cushions you when you freely ride over the bumps. The oversized wide seats with double springs ensure you are comfortable, cushy and soft when riding. Other specifications include grips made of synthetic leather, handlebars which are wide for comfort, waffle tread tires, and a protective guard which shields pant cuff from being rained on. This cruiser is specially designed for a big guy. When it is fully assembled, the bike is about 41.89 pounds, very light and perfect for a riding exercise. The coaster brake ensures less honking, squeaking, adjusting and fewer cables. Its style ensures that you maintain an upright position and provides plenty of room for your knees hence prevents you from hitting the handlebars. The heavy steel gauge enables you to lose some pounds if you want to keep fit. 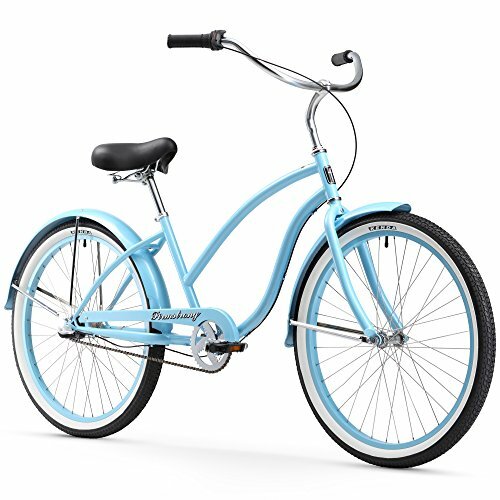 Beach Cruise Bicycle from Firmstrong is perfect for an easy and smooth ride. The Cruiser Comes in three speed which is ideal for climbing hills and long distance rides, a single speed which is perfect for casual cycling, and a 7-speed which makes use of a high-quality gear system from Shimano for internal shifting. This enables you to experience a higher riding intensity and cycle for longer distances that you never imagined could be possible with a beach cruiser. Coaster breaks are located on the three and single speed whereas rear and front handbrakes are offered by the 7-speed through the levers present at the handlebars. The curvy, classic steel frames have been enhanced by aluminum wheels (26 inches) with white tire walls 2.125 inches wide. The tires roll easily and smoothly and cushions you when you freely ride over road bumps. The seats are oversized and wide with double springs to ensure that you get the much-needed comfort, cushioning and softness during your casual ride. Other specifications include a protective guard, synthetic leather handlebars, and waffle-tread tires. The cruiser is ideal for riding along plain surfaces. The coaster brakes are designed to make it easy-to-use. The seat is wide enough to give you comfort when you are riding over road bumps. It is simply awesome and the solid choice for ladies who love riding for leisure or exercise. In today’s world, people are often finding motor vehicles a bit of a headache. They are slowly turning back to bicycles. Cruiser bikes as it sounds is not a complicated bike to ride. Simplicity is the main advantage of these bikes and its popularity is increasing at a tremendous rate. Better still, some are designed with a cage for putting water bottles or a rack in the rear part for carrying snacks, beach towels, and other items that you might at the beach. We are going to take you through the best beach cruiser bikes to look for. Cruiser bikes are designed such that they can provide an affordable bike ride to its rider, without any trouble of wearing a lot of gear. All you need to do is to take your bike on the street and start pedaling and go wherever you want. Beach cruisers feature the best bikes that are durable and of high quality to serve you for as long as you want. Every ride you take will be extremely comfortable and enjoyable than the one you had previously. They are perfect for long rides, short rides, commuting, hill climbing and exercising. They offer elegant ways of healthy traveling with very little effort. So the above list of the best beach cruiser bikes will help you a lot in your cruiser bike search. These top bikes will cover every range of bikes available in the market, whether it is for men or women. Another great thing about these bikes is that they are within the affordable price range. Once you start riding these bikes your level of confidence will automatically increase and you will feel much relaxed. Hope you have a great mile ahead with this bike.